Guide to Rank Boards - Soviet-Empire.com U.S.S.R. It should be noted that usually when one refers to the 'Soviet Army', this term embraces all service arms except for the Navy. 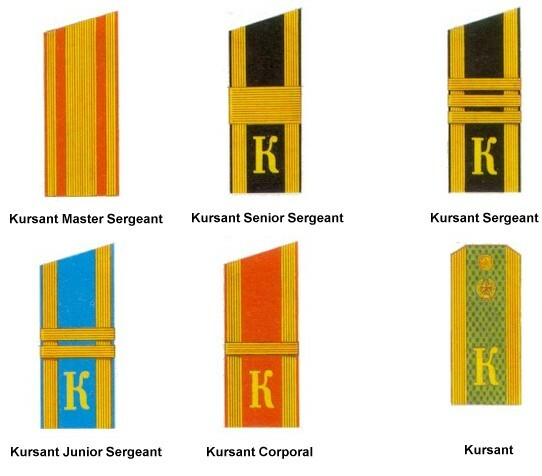 As such the range of rank boards and epaulettes is more comprehensive than for Western Armies. What also compounds the issue is that there were three main different kind of uniforms for the officers - Parade dress, Everyday dress and Field dress. Parade dress was worn by officers (out of formation) when they recieved their promotion to a new rank or when sent to a new post. It is also worn during the presentation of government awards or during parade when the officer is not marching himself. There is also an additional subclass of Parade dress being Parade-Restday. This uniform was worn during major public holidays, official receptions as well as off duty. Everyday dress (in formation) was worn during combat training and lessons as well as during exercies, and when on general duty. When out of formation it was used for staff duties divisional level or above as well as off duty. Field dress was intended to be worn during exercies, maneuvers, combat duties and while undergoing lessons or exercies in training centers. In certain cases for an officer the service he is in forms part of his rank. For example, the depicted epaulette is for a Lieutenant General of Medical Service. For a complete listing of Service Sleeve Patches click here. 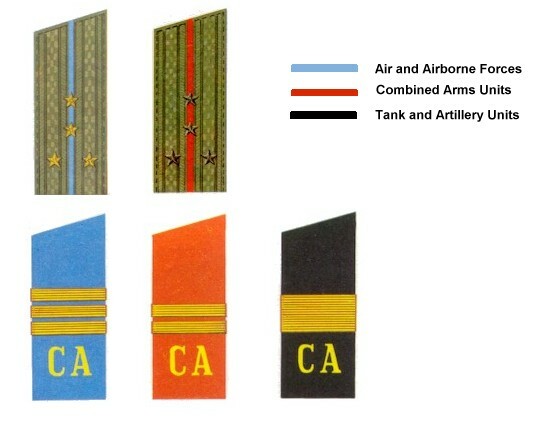 "Officer personnel in the ranks of major general through chief marshal of aviation, artillery, engineer troops, and signal troops and major general through colonel general in tank troops carry the designation of the branch as part of their rank; for example, chief marshal of aviation, marshal of armored troops, colonel general of tanks troops (who, upon promotion, would become a marshal of armored troops), lieutenant general of signal troops, and major general of engineer troops. The same criteria apply to technical troops (chemical, railroad, road, motor transport, and units of military topographic service). There is, however, no chief marshal or marshal rank for these troops; for example, colonel general of technical troops. special service designation. These special services have no marshals or chief marshals. So, one refers to a colonel general of intendance service, a colonel of medical service, a major of veterinary service, and a junior lieutenant of justice. There are, however, no general officers in the administrative service and no colonel generals of veterinary service. branches of the armed forces. Officers who complete studies at a higher engineer officer school or a military engineering academy earn the title of engineer, which is combined with the rank; for example, lieutenant-engineer, colonel-engineer, or colonel general-engineer. In the navy, the equivilant ranks would be lieutenant-engineer, captain 2nd rank-engineer, and admiral-engineer. Officers with a secondary military technical education use the title technical service combined with the rank; for example, junior lieutenant of technical service, captain of technical service, and colonel of technical service. There are no general officers of technical service." - US Army FM 100-2-3, 1991. Not all troops fell under the direct command of the Ministry of Defence (MOD). 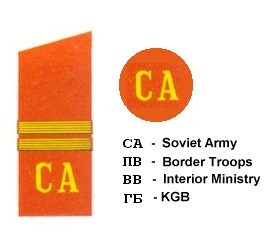 Some troops were designated as being under the command of the Interior Ministry (these troops were responsible for the protection of Party members), KGB (internal security) or as Border Troops (responsible for guarding all Soviet borders). 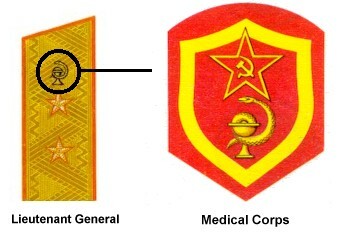 This was noted by lettering (in Cyrillic) on their rank boards. 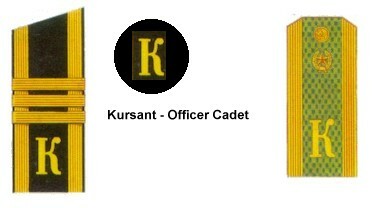 It was also possible that when entering the army recruits would be selected for direct officer entry, in which case while undergoing their training they would also become Kursants. Headquaters, Department of the Army. FM 100-2-3 - The Soviet Army: Troops, Organization and Equipment. Washington D.C.: Department of the Army, June 1991. USSR Ministry of Defence. Regulations on Wearing Military Uniforms. Moscow: Military Publishing House, 1989. Caza, S. M. Soviet Military Uniforms: A Translation of the 1988 Soviet Regulations. Ontario: Mamayev Hill Enterprises, 1995. Schofield, C. Inside the Soviet Military. New York: Abbeville Press, 1991. ISBN: 1 55859 160 5.